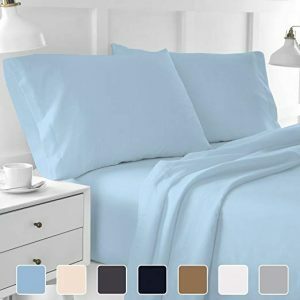 On Amazon today only you can get these nice Cottington Lane 400 Thread Count 100% Long Staple Cotton Sheetsets, 4 PCs, Queen Sheets, Upto 15″ Deep Pocket, Soft & Smooth Sateen Weave, Breathable Bed Sheets, Luxury Hotel Bedding, Light Blue for just $34.99! This is a 42% savings and will ship free. There are several colors to choose from.